Whether it be a long winter break or the festivities during the cold months, the winter season is a great time. Its last week of October and winter is just round the corner. So soon we will be digging into our lofts and beds for warm winter wear. The cold months of the year are so much fun. Foggy mornings, days without Sun and gloomy evenings..I per say don't really enjoy winters much coz they make me a bit lazy but still i have a few reasons to look forward to them. Cladded with heavy woolens, i always wish to tuck myself inside a warm cozy blanket! Lethargy seeps into my system..totally! One of the reasons why i look forward to Winters is the variety of flowers available all around. Oh yes! i love flowers..they make me smile...they seem to spread happiness with their vibrant colors..without a miss, i bring flowers at my home and meticulously arrange them in my vases and place them in the corners of my living room. They give me such a high! The second being the plethora of calorie filled food we all gorge on. I don't bother about those extra calories in my meal. Cold winters and a bowl of hot gulab jamuns..worth it! worth it! Ohhh..i cant wait to grab some now! Its just a matter of few months and i enjoy to the fullest. Winters bring along with it a wide range of vegetables and you can do soo much with it. Phew! Its insane. Stuff it and make parathas or deep fried delicacies. Love them in whichever they are made. I truly live to eat. :D After all Life is meant to be lived once and i wish to live it to the fullest. I hate to regret later for anything which i missed. Warm sunny days and cold nights are the apt time to feast with your family. Barbecue parties are so much fun. A sunny day with mild winter breeze, aromas from the barbecue grill and gossips with friends is my perfect idea of a winter Sunday. So my today's share is a perfect starter for a winter affair! 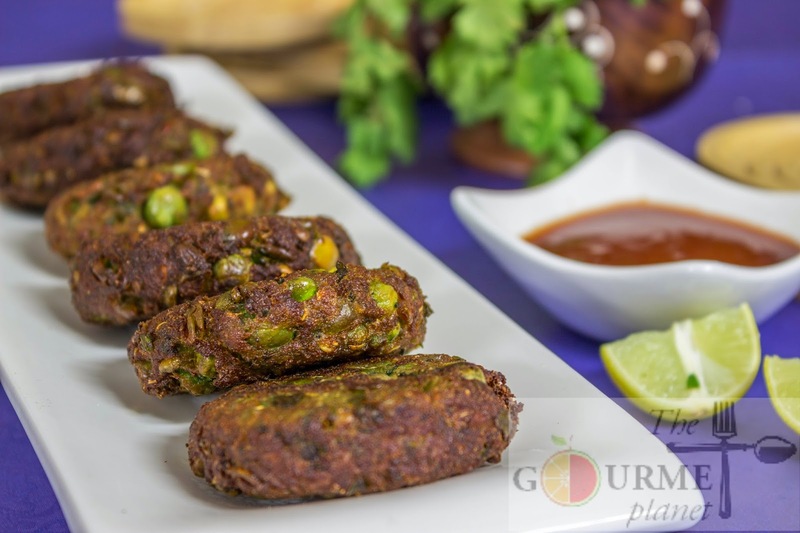 Peas or matar (as known to Indians) is available during winters and for sure its a delightful veggies for many of us. I love it in any form, be it just a Peas Pulao in Lunch or mildly tempered peas with ginger and chilly for breakfast. They are delicious. Truly appetizing. 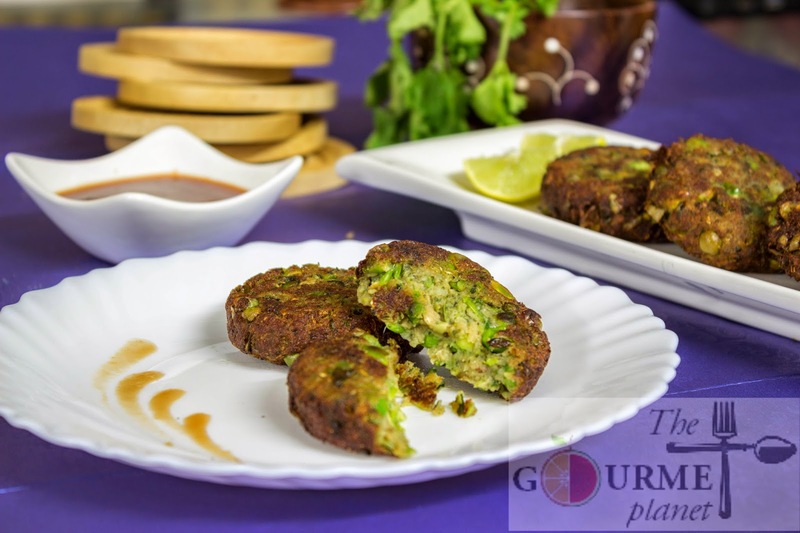 So today, i bring forth a delectable dish made out of peas which is not only different but is loaded with flavors and trust this is a right snacks or starter for those Sunday BBQ feast or the one of those evening when you have surprise guests. Quick to make if all ingredients are handy. Even those who don't relish peas otherwise will dote on this new avatar of peas. 1. If using fresh peas, then blanch them with little salt and when soft drain and spread on a kitchen towel to remove all excess water. 2. If using frozen, then blanching is not needed as they are already blanched before being frozen. 3. Transfer the peas to a mixing bowl and add finely chopped green chillies, chopped coriander and grated ginger and thoroughly mash them. 4. Now drain the water from the soya granules and ensure there is no excess water. 5. Now add the soya granules to the peas mixture and mix well. 6. Add mashed potatoes and ensure everything gets together well. 7. Then add the cumin powder, salt to taste, roughly ground coriander powder, black pepper powder, garam masala, kasuri methi & red chilli flakes and mix well to incorporate everything together. NOTE: You can alter the measurements for red chillies, green chillies, black pepper powder based on the level of spiciness required & your choice of taste. The existing measurements mentioned will give mildly spicy croquettes. 8. Then add the bread crumbs and flour (maida) and mix it well. 9. Now moisten your palm with bit of oil and make roundels. 10. Place a wok on the gas stove and add oil to it for frying. 11. One by one add the croquettes to the oil and deep fry and monitor the flame by alternating between low and medium. 12. Flip the croquettes when one side is golden and sieve them out when cooked well from both the sides. 12. 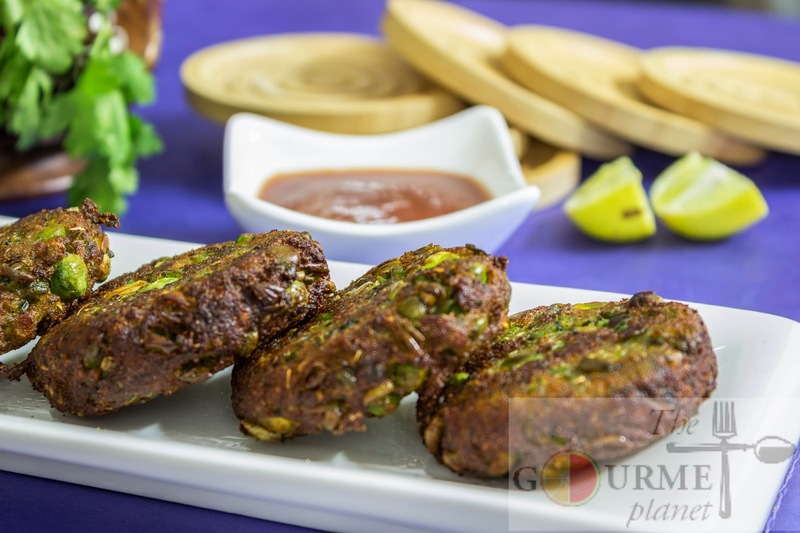 Sprinkle chaat masala on these croquettes and serve hot with your favorite tomato ketchup or any dip/chutney of your choice. 2. Place a parchment paper on the cookie tray and lay the croquettes onto them and brush them with a tsp of oil on both sides. 3. Bake in two batches for 10-15 minutes, turning every time until both sides are well cooked and appear goldenish brown in color.